Sister Mary Burke, SNJM departed this life on November 29, 2017 at Legacy Emanuel Medical Center, Portland, Oregon. Sister Mary had celebrated 75 years of life and 55 years of religious profession. Sister Mary Burke (Sister James Marie), age 75, died at Legacy Emanuel Medical Center, Portland, November 29, 2017. A member of the Sisters of the Holy Names for 55 years, her Mass of Resurrection will be held at 11 a.m., December 18, 2017, Chapel of the Holy Names, Lake Oswego, Oregon. Daughter of James and Marie Boyle Burke, Mary grew up in Portland. Following her graduation from St. Mary’s Academy in 1960, she entered the Sisters of the Holy Names and received the name Sister James Marie. 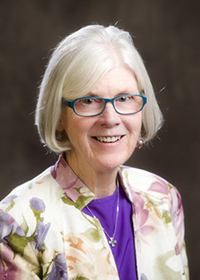 Upon completing her bachelor’s degree in 1965 at Marylhurst College, Mary began her career in elementary education at St. Joseph’s School, Salem, and Assumption School, Portland. After a time in the Marylhurst College Education Department, she returned to Salem as principal of Sacred Heart Mid-High and High School and then served as principal of St. Mary’s Academy, Portland. During this time, she received a master of education from Portland State University. Through her experience as principal, Mary became critically aware of the need for school administrators to be trained in development and made this a focus of her continuing education. After St. Mary’s, she became Assistant Executive Director of the Secondary School Department of the National Catholic Educational Association in Washington, D.C., and later worked for the Diocesan School Office in Toledo, Ohio. She continued her involvement as a consultant and board member until her death. Family was precious to Mary as were dear friends. She was a cherished sister and a faithful and loving friend. Her former students remember Mary as a patient and compassionate teacher, willing to spend extra time in helping them. To faculty colleagues she was an encouraging and supportive mentor and an insightful and skilled administrator. A woman of diverse interests, Mary was a gifted painter and photographer, particularly of the outdoors, which she relished. In past years she was a member of the Mazamas, a local mountaineering organization, and had scaled 14 Cascade peaks. She once said that next to teaching the outdoors was her number one priority. Mary is survived by siblings Michael Burke (PJ) and Patty Burke (George Summersby); nephews Ryan Burke and Sean Summersby; nieces Kimberly Auther and Kristi Krening; grandnieces Crystal, Violet, and Ayla; grandnephews Donnie, Steven, and Everett; numerous cousins and friends; and the members of her religious community. Remembrances may be made to the Marie Boyle Burke Scholarship fund, St. Mary’s Academy, 1615 SW 5th Ave., Portland, OR 97201 or the Sisters of the Holy Names Retirement Fund, P.O. Box 398, Marylhurst, OR 97036.